Craving for some steamboat delights? Come on down to Spicy House this April to enjoy its 1-for-1 promotional set menu ($68++) featuring beef, chicken slices, handmade prawn meatballs, pork luncheon meat and more. Plus get 2 complimentary servings each of rice, drinks and sauces to complete your meal. 2 persons now only pay $68++ (works out to $34++ per person) with this limited period 1-for-1 deal! 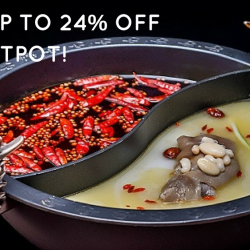 Till 24 Dec 2017 Spicy House: Enjoy Up to 24% OFF Authentic Mala Hotpot! The most hipster hot pot has come to Singapore and it's located at Riverside Point with a scenic view of the Singapore River. Enjoy up to 24% off authentic mala hotpot at Spicy House this festive season! Valid for lunch and dinner. Just make your reservation via HungryGoWhere! Till 31 May 2018 HungryGoWhere: Enjoy Up to 32% OFF Spicy Hotpot at Spicy House Restaurant! Found on the first floor of Riverside Point at Clarke Quay, Spicy House is the first overseas outlet of a restaurant chain originating in Shanghai. 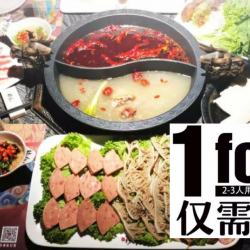 Throngs of people visit this restaurant on a daily basis to enjoy its signature Chengdu-style hotpot. With a menu that boasts over 100 ingredients and gloriously spicy a la carte dishes, diners are bound to discover something that appeals to their taste buds. 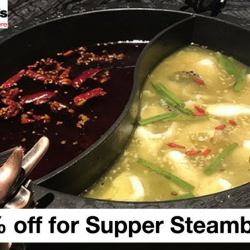 Enjoy 10% off your dining bill with no minimum spending required, or 12% off with a Citi Credit Card or 32% off supper steamboat when you book through HungryGoWhere!